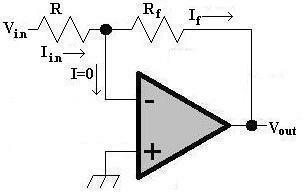 Operational amplifiers (Op-Amps) were used to solve mathematical equations utilizing analog computers. Based on the configuration, op-amps could add, multiply, integrate, or perform other operations on signals. The earliest op-amps were constructed with vacuum tubes. Solid state electronics, of course, allowed circuits to be more compact. Ultimately, circuits such as that shown at right, were developed into integrated circuits. 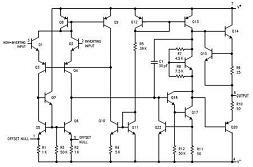 Like most integrated circuits, this greatly simplifies the process of understanding and op-amps. High voltage gain (80dB or more). Op-amps have two inputs and one output. 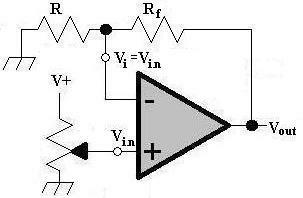 In a steady state, the inputs must be balanced because the gain of the op-amp is acting solely on the voltage differential between the two inputs. The capacitors (C1 and C2) are used to keep the power bus clean and help prevent feedback paths that might cause the op-amp to oscillate. They are often referred to as the bypass capacitors. In order to simplify the diagrams below, the power connections and capacitors are not illustrated. Negative Feedback: Routing of some of the output back to the input in a way to reduce the effect of the input signal, producing a "closed loop". 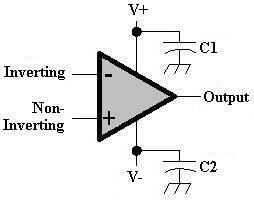 Vi: The inverting input of the op-amp. 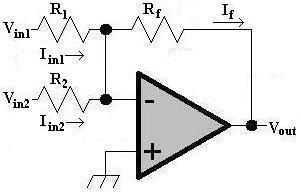 Rf = R -- 1 kΩ can be used as a starting point. Iin = If = Vin / R.
Rf = Av * R = 4 * 1 kΩ = 4 kΩ.